Flowers evolved to make insects happy, but humans claim them for their own edification and poetic purposes. 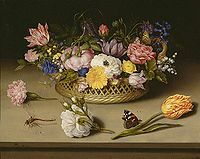 In the 16th century in Holland, painters zoomed in on flowers as if they represented a microcosm of everything worthwhile. 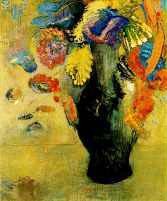 By the 19th century, flowers have become puzzling apparitions, as in Odilon Redon’s paintings. 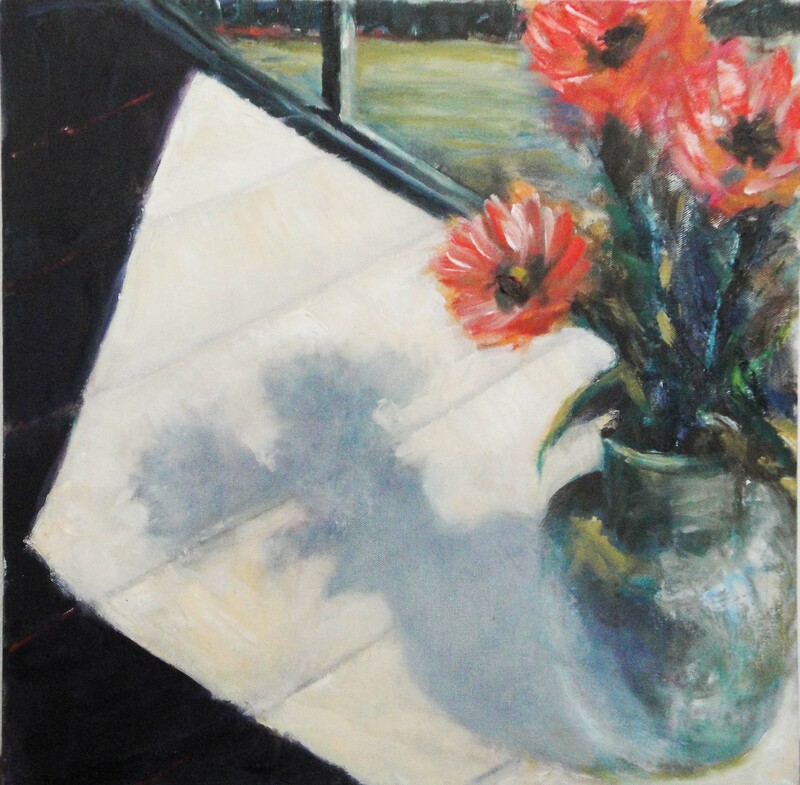 For a project in my landscape painting class, Ivan T. brought in a photo of a vase of flowers on a tiled floor being hit by very strong afternoon light. The shadows played into triangular and trapezoidal forms on the floor, so much so that these forms competed with the flowers, which were, by tradition, the point of the picture. But our modern sensibility tends towards off-centeredness and towards seeing objects in counterpoint with other forms. It felt quite “natural” to crop the photo so that the vase of flowers was not only off center but abruptly cut off. Ivan then invented the view through a sliding door, when in fact the photo only showed shadow patterns on the floor. This invention allowed him to create greater spacial depth and to introduce the complementary color with a green wedge of grass. The painting (about 16 x 14) then became a dynamic play of forms where negative space takes a leading role. In fact, the shadow of the vase—a kind of negative space or “nothingness”—is at the center of the painting. By not being requested to look at a definite, clearly identifiable object, i.e. the flowers themselves, our attention wanders through ephemeral forms of shadows. The painting, therefore, while jarring in its composition, has a tranquil, reflective presence in the mind. I love art that comes at me with that one-two punch.